Troi Oi! | Hello Saigon! When I was already working, a couple of friends and I joined a Mandarin class. The Chinese language has always been attributed to business so we were thinking learning a Chinese dialect can help us in our careers. Interestingly, a few months after, I was hired by a company with almost 90% of its employees, including top management, were Chinese. Their dialect was Fookien — my Mandarin class didn’t help one bit but it sure made me feel at home with the company. Fast forward to 2009 and we had to move here to Vietnam. The Vietnamese words are monosyllabic and the language itself is pretty difficult to pick up with an untrained ear and tongue. The Vietnamese language rely heavily on accentuation marks which can be (and still is) confusing at first. Even writing it requires a bit of thinking as you have to discern what is the right accent mark to put. I guess this is where the French influence manifests itself. In general, Vietnam is not an English-speaking country BUT they’re slowly getting there. With several international schools, language schools, and a steady stream of English tutors around, they’ll be better than Filipinos in no time. I kid you not because my Vietnamese officemates are really terrific English speakers. Last year, I joined a weekly Vietnamese class with our priest as our teacher, Fr. Lito. Too bad he left for Manila already for further studies. It was a delightful and insightful experience learning a new language. Aside from learning Tieng Viet, we were given a chance to understand the Vietnamese culture as well. Language is the doorway to understanding a people and its culture. 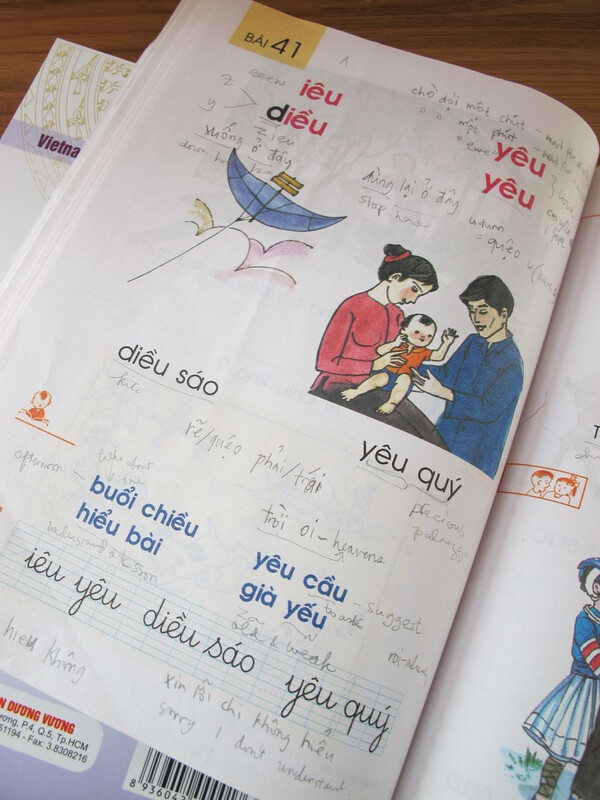 Unfortunately, I don’t get to practice much Vietnamese as I’ve been working in an English-speaking environment, my nanny is a superb English and Filipino speaker (though she’s Vietnamese), and as I’ve said, the Vietnamese are picking up English really well. But I’m thankful that I know how to read the Vietnamese words with the correct accents especially when giving out an address to the cab driver. I actually can read Vietnamese but I don’t know all the meaning to what I’m reading or saying! im di – shut up! troi oi! – Heavens! or Oh My God! If you have new Vietnamese words/phrases you think will be useful for me, please share! Hen gap lai sao! Tam biet! This entry was posted in Exploring Saigon and tagged Vietnamese language. Bookmark the permalink. 3 Responses to Troi Oi! I find this one invaluable! It translates to ” I am not a tourist, I live here” It has stopped me getting totally ripped off or hassled on soooo many occasions! 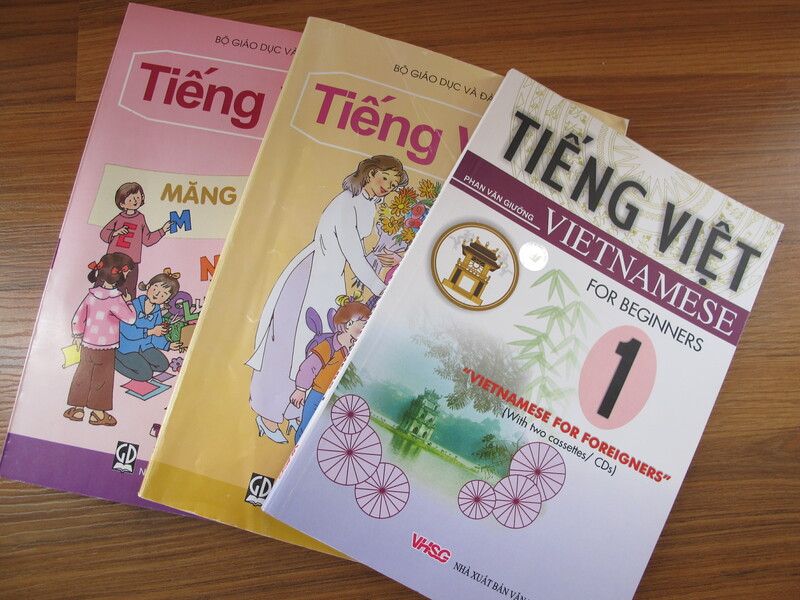 I learned a little bit of Vietnamese from our landlady who works in the education department. We had one-on-one classes twice weekly and she gave me a good book and cd as material. Actually, I paid for it (about 200,000 dong). It’s a nice book and I didn’t find it in any of the bookstores I’ve been to. A tutor is certainly the way to go. Too bad I stopped learning (after collectively 2 months of tutorial) because I keep forgetting a lot of things I learned every time we go back to the Philippines. Hehehe… Dani’s contribution is truly invaluable! I have to remember saying it in Vietnamese too!